Smashburger has come up with a brilliant way of preparing hamburgers. By smashing the patties to be as thin as possible, they maximize the crisp, browned exterior that makes a burger so delicious. You give up the juicy pink interior with this process, of course, but the resulting burger is very much worth it. Here are some of the best tools you can use at home to make smashed burgers in your own kitchen. There are a couple advantages to choosing a purpose-made tool like this Cuisinart grill press. For one, it’s designed to be deliberately easy to clean. This isn’t usually an issue since you’re usually just smashing things once and then removing your press, but if you want to cook meat with your grill press on top of it you might appreciate the extra bit of non-stickiness with this tool. Secondly, this tool is heavy. When you use a big spatula or a frying pan or something you have to actually press down yourself. This grill press has more than enough weight to do almost all of the work on its own. Third, cast iron can be heated up. This means that you can put your press on the grill (or in the oven), get it hot, and then use it to cook food from both sides at once. When you heat up this grill press and put it on top of a burger (or a panini) you can cut cooking times in half while producing a superior product. It’s a neat trick to add to your cooking arsenal. One final advantage: a cast iron hamburger press like this one will last you for a lifetime. Cast iron will rust over time if you’re not careful, of course, but you can simply scrub off any rust spots and resume using your press. There’s pretty much no reason to ever replace a tool like this. Grill presses like these aren’t too expensive, so don’t feel bad about picking one up just to make smashed burgers. With a bit of creativity, you’ll uncover a few other uses in your cooking. Since it’s made from cast iron, you can enjoy your smash burger press for many, many years. You smash burgers by pressing down on them with a flat piece of metal. The bottom of a frying pan is an absolutely perfect way to do this. 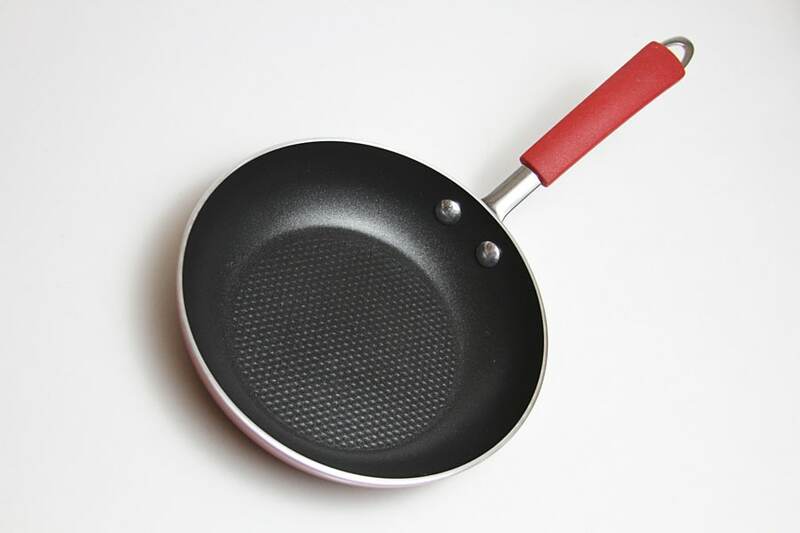 Your frying pan comes with a handy handle and you can easily push down on the inside of the pan with one hand to apply as much pressure as you want. In many cases, your frying pan will out-perform a dedicated tool. There’s a pretty good chance that you don’t need to purchase an additional tool for this. If you do want to purchase something, consider this Tramontina frying pan. I’m very much a fan of the simple aluminum design, the lack of any outlandish claims, and the high-quality non-stick interior. It’s pretty affordable, too. If you’d like to use your burger-smashing hobby as an excuse to pick up a new egg pan, this is one of your top choices. That said, you don’t want to use this frying pan for cooking your burgers themselves. This is because smashed burgers are best cooked over very high heat. While this Tramontina pan is an excellent addition to your kitchen, it doesn’t like temperatures above 400 F or so. Be sure to purchase a separate stainless steel pan (like this one) to actually cook the burgers. You can still use a non-stick pan to smash them, of course — your smashing pan won’t get very hot. If you were making smash burgers professionally, there’s a pretty good chance you’d use a tool like this one. It’s a big chunk of solid, food-safe metal with a handle that’s designed specially to handle high heat. The large surface area and strong construction make this ideal for supporting heavy cuts of meat and smashing your burgers to the thickness you want. 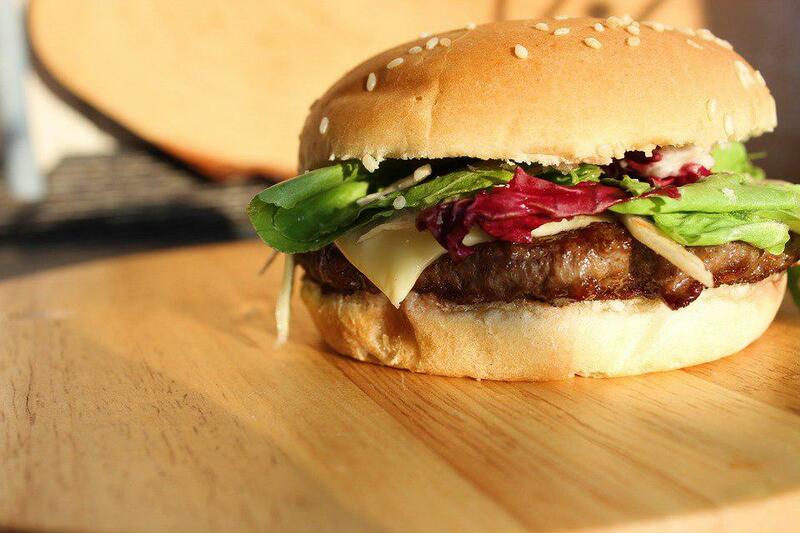 It’s also got plenty of surface area, meaning that you’ll apply pressure evenly to the whole burger. The big advantage of this tool is how handy it is when it comes time to flip your burgers. Smashed burgers are typically cooked on a metal surface over high heat. With no non-stick cooking surface, you’ll want a sturdy tool like this one in order to make flipping easier. The thin edge of this tool will work wonders. If you’re really serious about smashed burgers, consider sharpening the edge of this flipper to make getting between your burger and the skillet even easier. Honestly, if you do a lot of grilling or you frequently cook on a griddle, you’ll want to purchase a tool like this even if you don’t make smashed burgers. If you do, you’ll really appreciate how solid and large this flipper is. It’s a great tool to have by your side throughout the entire cooking process. I have it on good authority that the chefs at many fine burger joints around the world don’t use any of the above tools to smash their burgers. Instead, they use a regular finishing trowel. 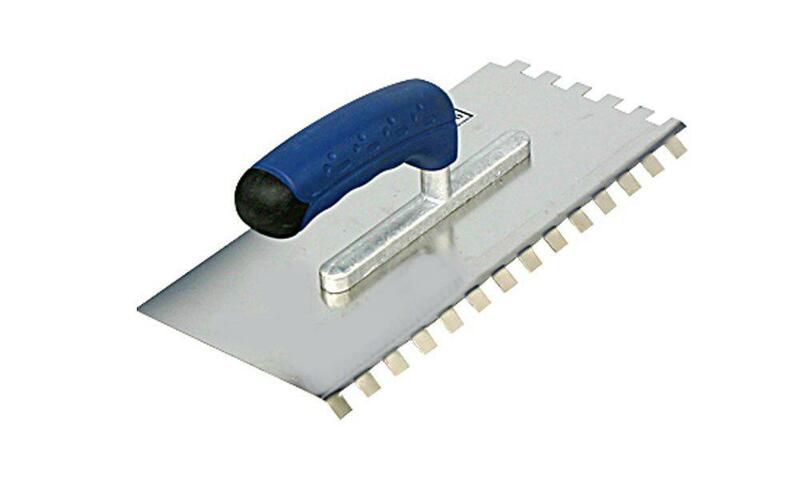 Finishing trowels are somewhat like grill presses in that they’re flat metal plates attached to a handle. The difference here is that they’re lighter, easier to handle, and even cheaper. This particular trowel is on the smaller end, meaning that you can comfortably fit the whole thing inside of a larger frying pan. The bigger trowels used in restaurants are often too large to fit in your pan. This isn’t a thing that you’ll be cooking with. Instead, you apply a bunch of pressure to your patty through the trowel, lift it, and set it aside. Cleanup is easy enough since there’s no cooking going on in between the burger and the trowel — it’s like cleaning a knife that you’ve used to “cut” ground beef. 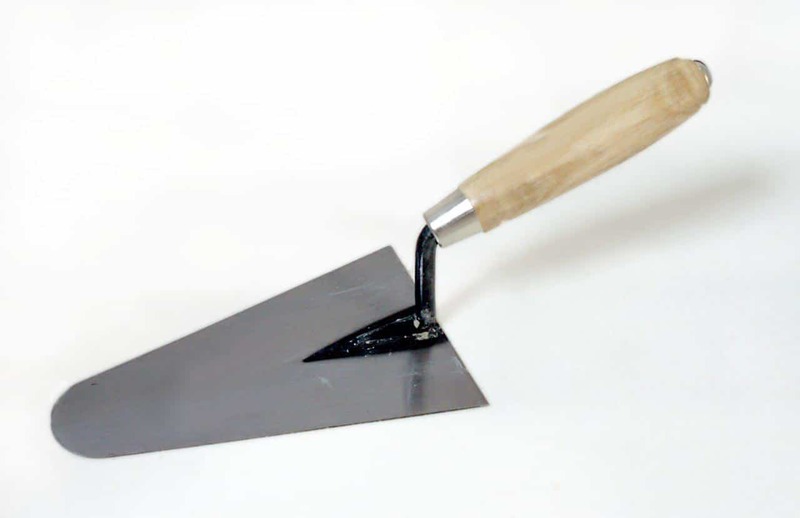 There are definitely some downsides to the trowel method — you need to apply pressure yourself, it’s a bit weird to keep a trowel in your kitchen, and you don’t get to use your kitchen trowel for very many other tasks. 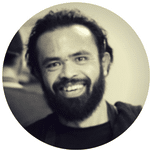 On the other hand, it’s about as authentic as you can get when it comes to creating a restaurant-quality smashed burger. 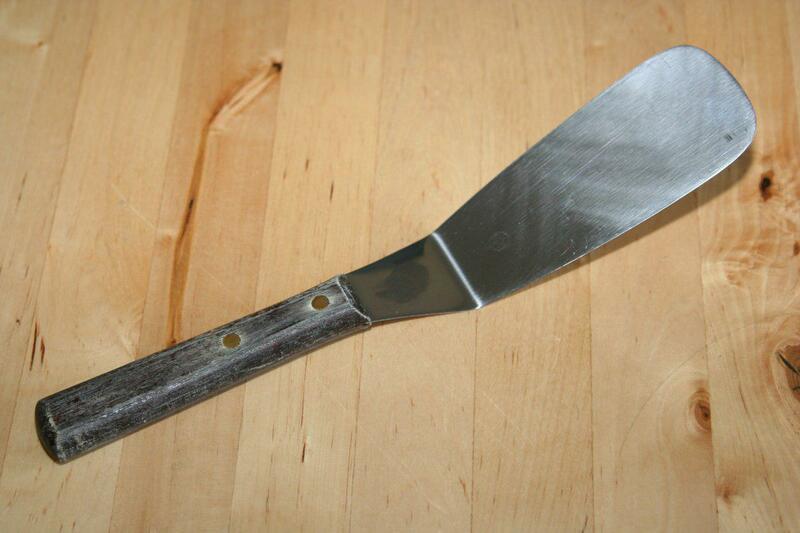 If you want the smashburger tool that the pros use, a trowel like this one is your best bet. Having the right tool isn’t enough. Here are some tips for making the best smash burgers in your own kitchen. While I recommend a non-stick pan above, that’s for the smashing. 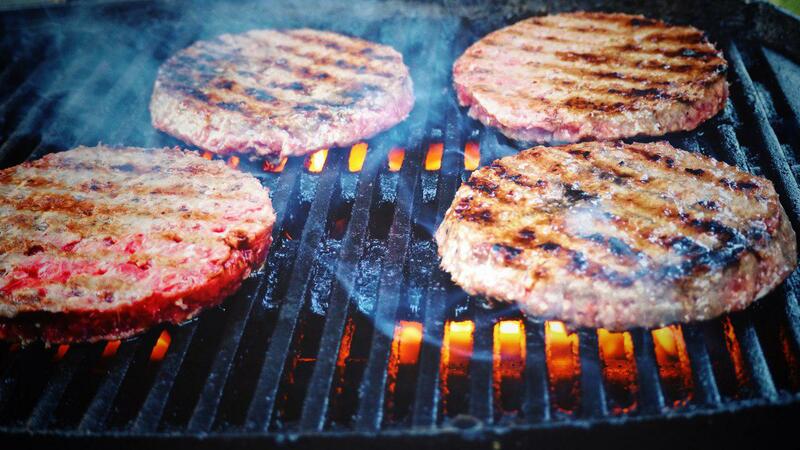 The pan (or griddle or cooktop) that you actually cook the burgers on needs to be stainless steel or cast iron. Why? It’s because you’re going to get it really, really hot. Most chefs recommend temperatures of 600 F or higher, up to 700 F. You can’t safely get non-stick pans that hot. PTFE-style non-sticks will literally vaporize above 400-500F, while ceramic non-sticks will stop being non-stick when you heat them up above 500F or so. You can still use a non-stick pan for the smashing, of course, but that’s because you’re not actually getting your second pan very hot. You should handle your smash burger patties a little bit differently from your normal burger patties. First of all, you should actually knead the ground meat a little bit in order to help break it down. You normally wouldn’t do this (in fact, you normally avoid any unnecessary handling) since it makes the patties more likely to fall apart. With a smashed burger, however, this is a good thing. You want your patties to smash down easily into a thin circle. Second, form your patties into fairly small meatballs instead of squished cylinders. Let your smashing tool do all of the work beyond that point. You don’t need to complicate things by forming patties before you begin. After you’ve heated up your skillet (or cooktop) to at least 600 F, throw your meatball on top and give it a solid smash. You don’t need to leave your tool on top for a while. Simply smash it down (use your other hand or a tool to apply even pressure) and then lift it back up. That’s it! Once you’ve reached this stage, you can season your patty with a bit of salt and pepper and sit back for a few seconds. Smash burgers take about a minute to cook, total, so be ready to flip them over pretty quickly. You might need a bit of pressure and a scraper to flip over your burgers. I’d recommend the professional flipper above. if you want, you can even use a whetstone or a file to put a bit of an edge on it to make the process easier. Either way, once you’ve flipped over your burgers, they’re done. You don’t need to wait for the second side to cook. You pretty much finish the job the instant the top side of your burger hits the hot pan. Simply add cheese and place your patties on top of your buns. You’re all good to go. Burger toppings are very much a personal choice, but you might find that smashed burgers warp your taste a little bit. The burgers themselves are pretty much just thin layers of crusty, browned beef that’s packed with the wonderful flavors produced by the Mallard reaction. This means you’ll want to showcase (but not overpower) your specially prepared patties. Personally, I’d recommend toasting your buns and setting the burgers on top of a bit of lettuce (to keep the bun crispy). You can use a couple tomatoes, a meager handful of onions, and some sort of mayonnaise (the real stuff, of course) to gently accent your patties and give your dinner guests the burger they expect. Some people like to add pickles, french fries, ketchup, and other toppings, but I’ve learned from experience that these ingredients go best on the side. If your guests want pickles they can add them themselves. If you are going to add more to your smashed burgers, consider working within a theme. While you could certainly server your burgers with a bit of buffalo sauce (and they’d be delicious), why not use a whole blend of toppings to deliver a unique spicy mouthful with each bite? Try grilled peppers, cajun spices, and maybe even pepper jack cheese. Alternately, combine grilled onions, grilled mushrooms, swiss cheese, and your favorite herb aioli to create fancy burgers that you and your guests will love. There are a variety of tools you can use to smash your burger patties down to make a perfect burger. You can use a trowel (like the pros), a spare frying pan, a grill press, or even a flipping tool. No matter what tool you choose, you’ll be sure to get great results as long as you follow the above tips for making smashed burgers at home. When you use the tools and tips above, you’ll get delicious, thin burgers that are super crispy and packed full of flavor every time.